Our members have access to one-on-one advice, mentoring, peer-to-peer education and business networking opportunities as well as exclusive board opportunities available no-where else in the market. Our easy to navigate resource centre provides members with regularly updated articles, how-to guides, opinion pieces, videos and webinars as well as thought-leadership from some of the world’s most respected authorities on board, leadership and management practices. Join us for a board-ready masterclass unlike any other, exceptional business networking and peer-to-peer learning experience. Limited places available, register early to secure your place. 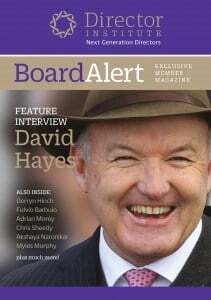 Download a copy of our latest Board Alert filled with exclusive interviews, thought leadership and insights from Director Institute. Download the latest Board Alert. In this issue, hear from several amazing leaders & legends in their fields including Senator Derryn Hinch & David Hayes. Search our comprehensive resource centre for articles, interviews, videos and webinars to help you build your board career and improve board performance. Latest Webinar on How to Kick Start Your Board Career with Kylie Hammond, click here. Boardrooms are the epicentre of control and governance so what happens when crisis strikes, is the board prepared for the event, or do they compound the problem? This Month Peter Holtmann Chair and Board Member, shares his insights and advice. As a Director of a boutique management consultancy, investing time in myself is a rare occurrence. However, I made the the time to spend a day at the Welcome To The Boardroom Masterclass in Brisbane – a really worthwhile investment of time. Many thanks for Kylie for a really insightful and inspirational day – exactly the challenge and opportunity for targeted self reflection that I needed. The day has provided me with some of the building blocks that will hopefully form the basis my board career going forward. I recently joined Director Institute and attended the Welcome to the Boardroom Masterclass event. It is very well presented, logically structured and focused on your director career development. Kylie is a very professional presenters and gets the message across efficiently. Refreshingly so, they offer a logical practical approach and avoid long-winded theoretical waffle. It is a worthwhile event, cost-effective and highly recommended. I was fortunate enough to recently attend the Director Institute Welcome To The Boardroom Masterclass. As a first-time attendee, I found the session very interesting and rewarding. The content was extremely relevant for professionals contemplating a board role, or indeed a career as a non-executive director. Topics covered included career planning, leadership, networking, personal branding as well as transitioning from executive to board positions.The workshop was an ideal size and encouraged interaction around the room. The flow of the session was great. It also offered an immediate networking opportunity with other attendees which was actively encouraged.Overall, I would recommend for anyone considering a non-executive board career to attend. It is quite confronting to have to write about one’s self, mentioning all the positive attributes you think a newly introduced person will want to know first off, to warrant an interview for a Board position. Kylie guided us through it with spirited discussion and the vibrancy one would expect from two very successful women. The networking opportunities were outstanding and I have already had emails back today from people wanting to get started on possible business and offering their network for introductions. Kylie spends a lot of time at the big end of town and were happy to share their insights in whats happening where. In this rapidly changing world where its difficult to keep up with everything, all of the time and decipher what is fake news and what is not, its good to spend time with people who are so up to date and so well connected as to have the real inside information. https://www.directorinstitute.com.au/di/wp-content/uploads/2016/06/icons-di-logo-gold.jpg 400 400 K H https://directorinstitute.com.au/di/wp-content/uploads/2016/06/Logos-for-Web-with-Gold-Overlay-white-next-gen.png K H2017-06-06 12:22:312017-06-06 12:27:01Why Director Institute? Are you eligible to join Australia’s premier Director Institute? By clicking submit you agree to receive email correspondence from us. You can opt out at any time.